I feel a little relieved that the scramble for Valentine’s Day planning is over. What’s that? You still want to plan something but have no idea where to start? No worries…I planned a whole mix ‘n’ match dinner menu to cook for date night at home, with meatless and gluten free options. 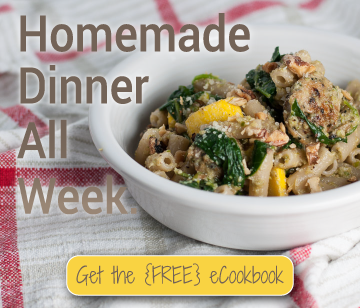 It feels and tastes special and indulgent, but most of the cooking can be done ahead of time, quickly during date night so you don’t spend 3 hours in the kitchen, or, best of all, with your date. Dessert is a (difficult) choice between flourless, chocolatey brownie piled high with whipped coconut cream or romantic French olive oil and wine cookies that are way easier to make than they sound. My first go at the cookies was a struggle, but luckily you get the polished version of the recipe which will go off without a hitch. So instead of wasting a glass of wine on a throwaway batch of cookies, you can have that glass while you bake them! Everyone wins. Namely you. Approximately 2.7 hours of my life was recently spent designing this, in my opinion, fun little graphic for my Pinterest addict friends. Let’s just say design–colors! fonts! details!–doesn’t come easily to me (hello former accountant), but I’m working on it and trying to let the spirit move me to do what I think looks cool. So hopefully everything I resonate with in a fuschia and gold Valentine’s color scheme is not totally off-putting to you. My point is–if you think it’s cute or otherwise appealing, feel free to re-pin it and share the menu planning love. Alright, that felt a little like housekeeping, but I just want to make sure I don’t drop the ball on what is surely some of your favorite holiday. Now we can move on to this glorious cheesy zucchini pile, the latest stop on the Tour de Gratins. A month into the journey, conversation over this dinner, perfectly complemented by Ashley’s polenta breadsticks and a quick marinara, revolved around the diversity of all four of the gratins we’ve tried so far. When I decided to cook through the Gratins chapter of The New Vegetarian Cooking for Everyone, I imagined that each week would consist of a different vegetable nestled in a cheesy white sauce, not that my perception of the definition of a gratin would be progressively expanded, week by week. Cutting/scooping into this zucchini masterpiece was more like cutting a piece of veggie lasagna, sans noodles, than diving into a thick, creamy sauce with barely identifiable bits of vegetables. First comes a layer of sweet, tender red onions cooked almost to caramelization on the stove. Combined with the liquid thyme they’re sautéed in and all the liquid that bakes out of the zucchini, it tastes wonderfully similar to a bit of french onion soup. Next up are layers of browned zucchini slices, sharp kalamata olives, and grated parmesan, with thin slices of mozzarella buried somewhere in the middle. 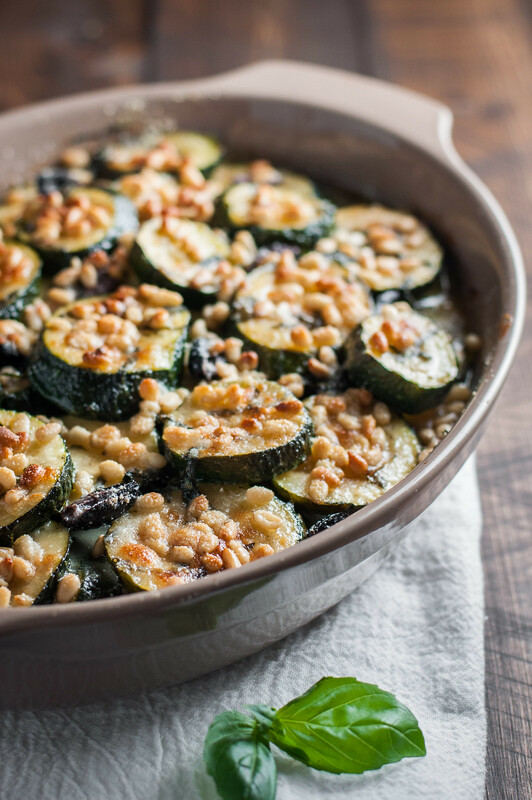 On top is not a layer of crispy bread cubes or crumbs, but of golden brown pine nuts added just before the gratin is fully baked. In the book, Madison titles this dish simply as what it is, but I couldn’t think of a more fitting description than “Mediterranean”, given my specific ingredient choices. I was kind of thinking “Greek”, but the basil and mozzarella drag Italy into the mix, so I had to generalize a bit more. Obviously it’s not prime zucchini or basil season, but most of us aren’t subject to seasonality in our grocery shopping. 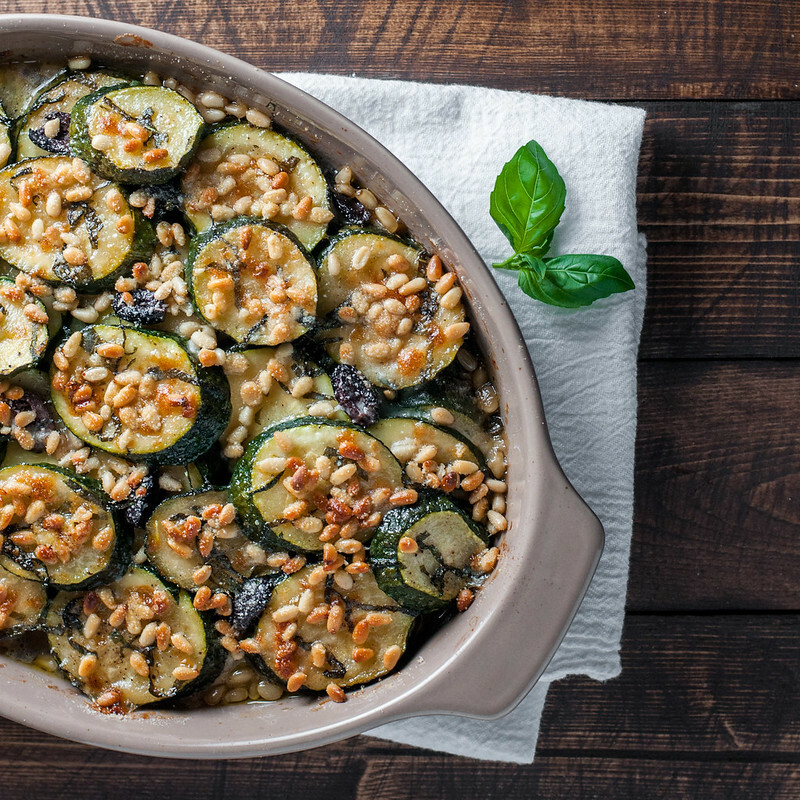 That doesn’t mean we shouldn’t shop seasonally, and this gratin would be even better in the summertime when your basil and zucchini look much happier. If you’d like, tuck it away until then. Or, to avoid spending money on lackluster herbs right now, substitute parsley. Either way, you can find a use for the leftover leaves in a batch of pesto, like the one that now inhabits my freezer in the form of pastel green ice cubes. Less than a half hour ago, I clicked the button to sign up for my first CSA share. I’m beyond excited for June when we get the call to start picking up our weekly shipment, and I can go back and start hitting some of the gratins I’ve been skipping that contain truly seasonal ingredients. Apparently kohlrabi isn’t as easy to grow in Argentina during the American winter as zucchini? Regardless, for once I will be thrilled to see that oddball of a vegetable that no one ever knows what to do with, because I will be helping it find its home in a double batch of kohlrabi and blue cheese gratin. Yep, I’m on the polar end of the population that adores blue cheese. You might have noticed the scarcity of process shots in these posts, but I have a good excuse! It defeats the therapeutic effects of cooking when I constantly have my camera in hand, waiting for or racing the perfect natural light, which basically doesn’t even exist in my kitchen. It’s so contradictory–my love of creating in the kitchen is what motivated me to start this little space on the web, but there’s this drive to be perpetually working on it. As in, I dream about how to photograph a plate of cookies just like I used to dream about tax filing deadlines. It’s a total relief to reserve building a gratin every week as “me time” in the kitchen, without the pressure of significant recipe testing or photography. Even if you’re not a food blogger or photographer, the cooking process can be a nice relaxing end to the week or wind-down activity at the end of the weekend. 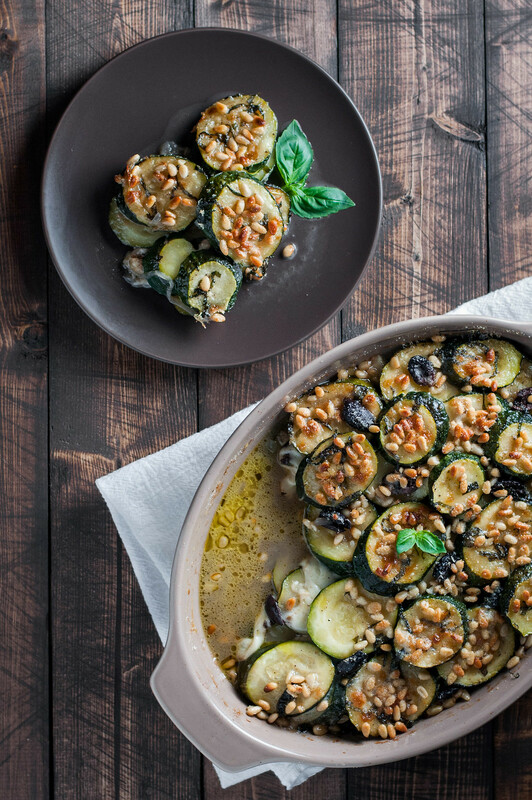 A noodle-free zucchini lasagna of sorts, lightly browned zucchini slices bake between layers of parmesan, mozzarella, olives, basil, and pine nuts in this gluten-free gratin. Heat 2 teaspoons oil in a wide skillet (with a lid) over medium high until hot. Add sliced onions and thyme and stir for a few minutes, until softened but not browned. Reduce heat to medium, cover, and cook until very soft and fragrant, stirring occasionally, about 10 to 12 minutes. Adjust heat as needed so the onions sizzle gently. Remove from heat, season with a sprinkle of salt and pepper (about ¼ teaspoon each, or more to taste), and spread in the bottom of a standard sized gratin dish or pie plate. Preheat oven to 375 degrees (F). Heat another teaspoon of oil in the same skillet over medium. When hot, add half the zucchini slices in close to a single layer. Cook, stirring every couple minutes, until starting to brown, about 5 to 7 minutes. If zucchini stick to pan, turn down heat slightly. Off heat, season with salt and pepper to taste (as if you were eating them alone), then layer over the onions in the baking dish. Repeat cooking process with another teaspoon of oil and remaining zucchini, leaving the second half in the pan until needed. Over the zucchini in the baking dish, layer half the basil, half the olives, and almost half of the parmesan. Arrange mozzarella slices over the top, then repeat with another layer of zucchini, basil, olives, and parmesan, leaving a tablespoon or so of parmesan for later. Cover baking dish with foil and bake 30 minutes. Remove from oven, uncover, and carefully sprinkle with pine nuts, remaining 2 teaspoons olive oil, and remaining parmesan. Bake 10 minutes until pine nuts are lightly browned. If not browned, heat under the broiler for a couple minutes, watching almost constantly so the pine nuts don't burn. I found it easiest to scoop, not cut, servings of this dish, being careful to keep the pine nuts on top. 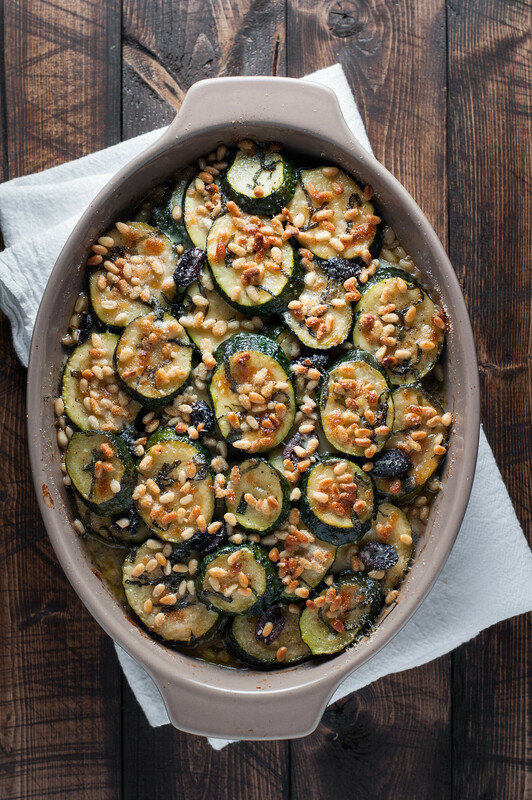 The gratin is a bit watery (I prefer "juicy")--it's just the nature of zucchini. The liquid is actually infused with all the flavors of the gratin--thyme, onion, olives--and it wouldn't be half bad (or bad at all) for dunking of bread. For cleaner serving, use a slotted spoon to avoid dinner plate puddles. If desired, spoon off some of the liquid before storing any leftovers.